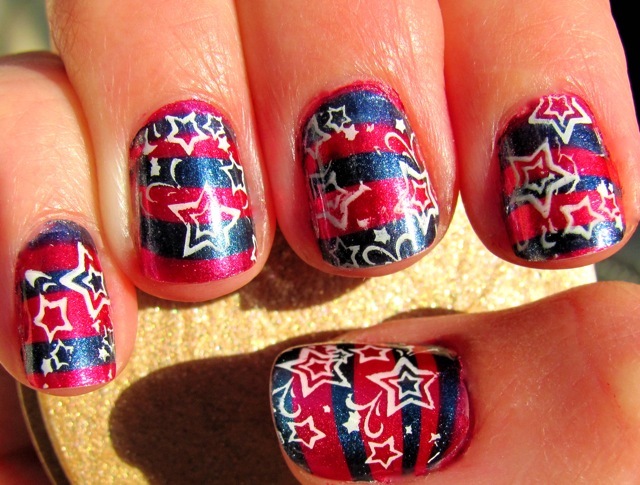 Time for another holiday manicure. 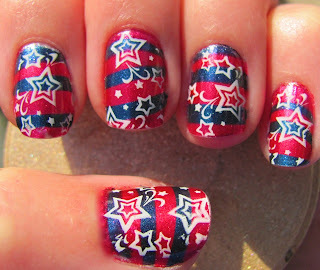 It's Independence Day here in the U.S. and to be patriotic, I am going with a "stars and stripes" motif. 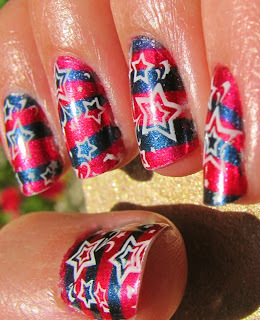 It took a few attempts on color combos and what worked with marbling, but I very much like how it turned out. So if you are celebrating with me, enjoy the fireworks and have a safe and happy holiday! I first painted three coats of China Glaze Cheers To You and and then stripe marbled (aka not swirling marble colors) with Go Crazy Red and Midnight Mission On top I used Bundle Monster plate BM21 with Konad Special Stamping Polish in White, then coated it all with Seche Vite. Your manicure looks so nice!